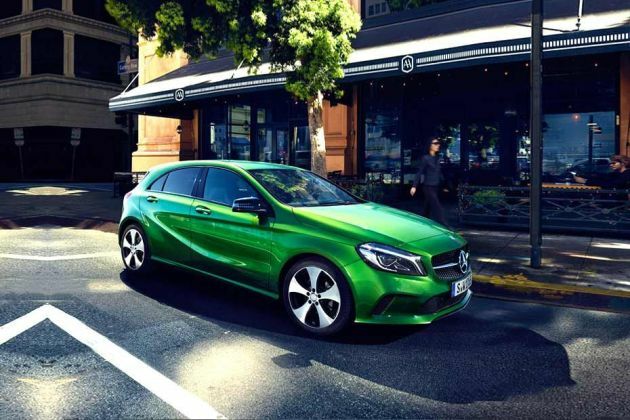 Mercedes-Benz A-Class A 180 Sport is one of the two variants in this well-famed model series. The vehicle is revised with minor updates to improve the overall driving experience. Starting with the tech specs, it is powered by the same 1.6-litre turbocharged engine, which takes the vehicle to a top speed of 202kmph. Its prowess on the road is guarded with a range of important safety features. Techno aids prevent loss of control, ranging from the ABS, the ESP, the ASC, while an electromechanical power steering system imparts aid to the driver in case of critical drive scenarios. Also present is a tyre pressure warning system, a seat occupancy sensor for the front passenger, a central locking system and an automatic locking facility for the doors. The insides include a 3-spoke design steering wheel comes along with 12 function buttons and a gear shift lever in leather. All of this is further strengthened with the addition of numerous comfort facilities. A 11.4 cms color display is integrated into the instrument cluster for a more lavished cabin environment. A trip computer is present for the benefit of the driver, along with a current consumption indicator and an outside temperature display. Other notable features include an illuminated glove compartment, electrical adjustment and memory facility for the driver's seat. Bluetooth interface provides a central hub for hands-free calling and audio streaming within the cabin. Going along with this is a color display with a 14.7cms screen, a speed sensitive volume control and a central infotainment controller on the central console. The vehicle has a greatly appealing persona which blends rich design themes with a modern and sporty sculpture. With its low, streamlined shape and balanced outer proportion, it evokes the impression of a genuine sports car. The swept back windscreen gives it a sound aerodynamic quality to go along with the drive. Posted at the front is a bold radiator grille with two louvres in the vehicle color. Embellished upon this is a high quality chrome trim, which exerts an effect of radiance and beauty over the vehicle. Adorned at the top of the grille is the star emblem of the brand, making a more distinctive mark upon the overall look. The headlamp clusters on either side come along with Bi-Xenon lights, and a cleaning system is also present for the best functioning capacity. Present for this car are 5-twin-spoke light alloy wheels painted matt black, and with a high sheen finish. The side profile is given its true grandeur with the sweeping body lines, which add to the prominence of the car's image. There are electrically foldable mirrors for a more eased out functioning, and the aspherically curved mirror glass adds to the unique look. At the rear, the new design of the lights gives the car a more refreshed taste, and there are fog lamps that improve the safety when driving. The cabin is quiet spacious, and it has been done up for a rich and sophisticated image. The well designed ergonomic seats come along with Artico upholstery, adding to the quality of the occupants' drive. The door center panels come in Messancy for a more exclusive aura. At the front, the instrument cluster comes along with a multi-function color display. For the benefit of the driver, there is a 3-spoke multi-function steering wheel which comes with 12 function keys. The wheel and the shift lever are wrapped in Nappa leather, adding a more plush dimensions to the driver's experience. Within this car is a 1.6-litre petrol engine which displaces 1595cc. It consists of an in-line 4-cylinder configuration, and is further improved with a variable valve timing feature. A turbocharger has been built onto the plant, boosting its performance. The power-train generates a torque of 200Nm at 1250rpm to 4000rpm, coupled with a power of 122bhp at 5000rpm. The working of the engine is further enhanced with a seven speed dual clutch transmission, which ensures a strain-free functioning for the driver. Aside from this, a direct fuel injection system brings smoother fuel transmission and minimal hassle in the process. The front arm of its chassis has been rigged with a McPherson strut, while for the rear, there is a completely re-designed four-link axle. An integral electromechanical steer control system further augments control and handling, supporting the driver in critical situations. Strong discs have been clamped by all of the wheels, all round and internally ventilated discs upon the front for improved working. The steering column comes with a height and reach adjustment facility, ensuring minimal discomfort for the driver. Then, the air conditioning system permeates the cabin with an enjoyable aura, and it is further aided by a dust filter. Power windows further reduce hassle for the occupants, and they come along with a one touch control and obstruction sensor. A rear central armrest is present for improved convenience, and it comes along with cup holders for added relief. Also present is a boot lighting facility, an armrest for the driver and a stowage compartment beneath the armrest. An ECO start/stop facility improves the fuel efficiency of the vehicle. High quality entertainment is provided with an Audio 20 CD radio that comes along with a dual tuner, an MP3 feature, a compatible CD player and a USB interface for the most exclusive experience possible. An advanced airbag system provides optimal shielding to the occupants, consisting of front row airbags, side impact pelvis airbags and window airbags for the front occupants and the rear occupants. Many active safety programs elevate control and stability when driving, and this includes the brake assist system, attention assist, hill start assist, acceleration skid control, anti lock braking system, electronic stability program and a curve dynamic assist as well. Audible warnings alert the passengers in case of unfastened seatbelts. Then, there is an auto dimming interior mirror, a crash responsible emergency braking, and a lamp failure indicator. Childproof doors and windows add to the safety insulations of the vehicle. 1. Exquisite aura within the cabin, with loads of features. 2. The outer design strikes an awe-evoking pose. 1. The top speed could be enhanced. 2. Its price could deter a great many buyers.